All you need to know about guitars, how to play them and how to look good doing it. What is a rotary speaker? A real rotary speaker is a device constructed by Don Leslie as a way to get a Hammond Organ to replicate the spread sound of a pipe organ. It´s designed to get the sound inside the speaker cabinet directed by rotating objects, using amplitude and frequency modulation and the doppler effect. The result is a complex mix of tremolo, phasing, pitch-hifting and ambience which gives your tone a rather unique flavour. These original speakers are really big so an emulating pedal is way neater (and it doesn´t kill your back on your way to the gig!) and a really great invention. Beatles used the Leslie rotary speaker on many tracks and different instruments, the vocals in "Tomorrow Never Knows" is one example, the lead guitar in "While My Guitar Gently Weeps" is another (played by Eric Clapton, who has used this effect on many tracks, originally inspired by The Beatles great use of it). You can also hear the characteristic effect on the Tom Petty song "You Don´t Know How It Feels" and on Soundgarden´s "Black Hole Sun". Another guitarist that liked this effect was Jimi Hendrix, who employs it on the solo of "Little Wing". David Gilmour of Pink Floyd uses the rotary speaker effect on tracks like "Brain Damage" and "Any Colour You Like". A more modern example is Alex Turner of the Arctic Monkeys who uses the effect on tracks like "The Hellcat Spangled Shalalala" and on the solo on "Teddy Picker". Which pedal should i get? There´s two really great options, the Hughes & Kettner Rotosphere and the Strymon Lex. The Rotosphere may be a bit noisy, but that´s what a real Leslie speaker is as well. 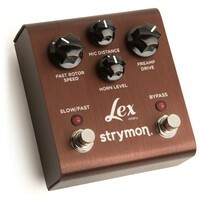 The Lex is a bit more quiet unit that´s also half the size of the Rotosphere pedal. But if you choose between these two pedals, let your ears be the judge instead of the size. Which one that sounds more authentic is for you to decide. 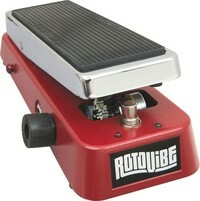 Dunlop also makes a rotary speaker pedal in a somewhat different shape; their Rotovibe has been made in the wah-fashion with a switch that can be rocked forwards and backwards to change the frequencies. 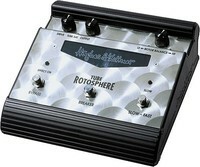 Another fan of rotary speaker emulation, Zakk Wylde, has his own signature serie of this pedal.